You guys... Santa Sessions are SO.MUCH.FUN! See my Assistant, Erin, and I smiling with Santa above? We LOVE these mini-sessions! 2018 was our 4th Annual Santa Mini-Sessions, and they did not disappoint! I loved working with all of the Littles, and seeing their reactions and excitement about Santa. 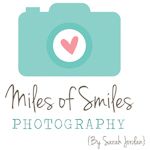 Here is a peek into our morning from last year's Santa Mini-Sessions at the Miles of Smiles Photography Studio.